You need an air conditioner! If there's one thing that Concord residents know too well, it's just how much the temperature can rise in the middle of summer. It can put a heavy demand on your air conditioning system. This is when having a reliable air conditioner installation within your building can prove its most useful. Whether you're looking to have a central air unit installed, heat pump, or high-efficiency air conditioner, you can depend on the experts at Concord Heating and Air Services. They will provide you with the variety and quality you're looking for to keep your property cool. We bring the Concord area a variety of air conditioning unit options. This ensures we can provide your building with the perfect level of cooling along with affordable monthly energy payments. Whether you're looking for a high-efficiency air conditioner for your property or a central air system that you can depend on, make the choice to reach out to our professionals for your installation needs. We will ensure that you get the best options in the city and the qualified delivery of these units to your property. Even with regular maintenance, repairs are an eventuality for almost every installation within your property. Ensuring that you have the capability to get the most experienced professionals called in and delivering their services to your needs is important. 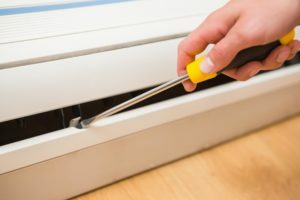 Concord Heating and Air Services has been bringing air conditioner repairs to the area and knows what it takes to service your needs. We provide you with the means to extend the life of your AC units, and to do so through affordable service options. When you need a reliable air conditioning repair, you can depend on your local HVAC experts. If air conditioning is beyond affordable repair, or you are looking to update your current installations with a high-efficiency alternative, contact us today. Making the choice to reach out to your local commercial and residential HVAC experts will ensure that you have the widest range of options available to you and an affordable means to replace air conditioner units. No matter the service you call upon our professionals for you can be sure that we are constantly aiming to bring you results that you can count on for many more years to come within your Concord area property. We have the areas highest quality and reliable air conditioning units to choose from, bringing you the capability to control the temperature of either residential or commercial properties with ease. By working closely with our specialists, you will have access to the perfect sized unit for your needs and the means to have them easily installed. Whether you're looking to bring a new unit to your building, to repair a current installation, or even to fully replace your current HVAC systems, making the choice to reach out to our experts will provide you with speed and efficiency for any of your service needs. This page brought to you by our friends at St. George Heating and Air.